^ 262 Phase I Selections from the 06.2 Solicitation. （原始内容存档于2007-09-27）. ^ Adamowski, Jaroslaw. 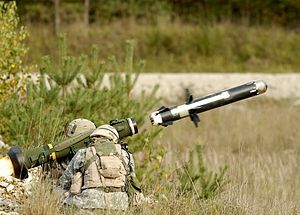 Javelin Missile Scores 100 Percent in UK Vehicle Tests. Defensenews.com. [2017-05-30]. ^ Raytheon/Lockheed Martin FGM-148 Javelin. Designation-systems.net. 2005-04-07 [2017-05-30]. ^ The World Defence Almanac 2010 page 418 ISSN 0722-3226 Monch Publishing Group. Australia was one of the first countries that the US government gave "unrestricted" permission for the export of the Javelin . ^ Jones, Richard D. Jane's Infantry Weapons 2009/2010. Jane's Information Group; 35 edition（January 27, 2009）. ISBN 978-0-7106-2869-5. ^ Gibbons-Neff, Thomas. This highly advanced U.S.-made anti-tank missile could now be on Syria’s frontlines. The Washington Post. 2016-02-23. ^ Lockheed Martin press release 互联网档案馆的存檔，存档日期2007-03-27. ^ Taipei Economic and Cultural Representative Office in the United States – JAVELIN Guided Missile Systems (PDF). DSCA. 2008-10-03 [2008-10-05]. （原始内容 (PDF)存档于2011-07-16）. ^ MOD press release 互联网档案馆的存檔，存档日期2008-03-03. ^ Javelin Medium Range Anti-tank Guided Weapon 互联网档案馆的存檔，存档日期2013-01-10. ^ Abate, Tom. Military waste under fire / trillion missing -- Bush plan targets Pentagon accounting. The San Francisco Chronicle. 2003-05-18. ^ Schmitt, Eric; Thompson, Ginger. Broken Supply Channel Sent Arms for Iraq Astray. The New York Times. 2007-11-11 [2010-05-02]. ^ Pandit, Rajat. India to order large number of Javelin anti-tank missiles from US. The Times Of India. 2010-08-17. 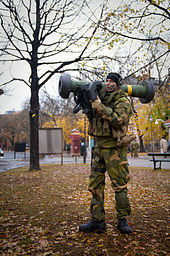 ^ Javelin Anti-tank Missile, U.S. Army Weapons, America's Army 2 Game Manual. [2011-10-08]. （原始内容存档于2011-09-29）.